Shirin Faraz is an Iranian football club based in Kermanshah, Iran. The club is in the private ownership of Farman Karimi. 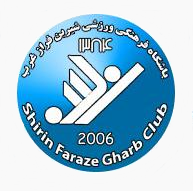 Before the start of the 2006-07 season, Oghab F.C., a team with much history sold its right to participate in the Azadegan League to Shirin Faraz.